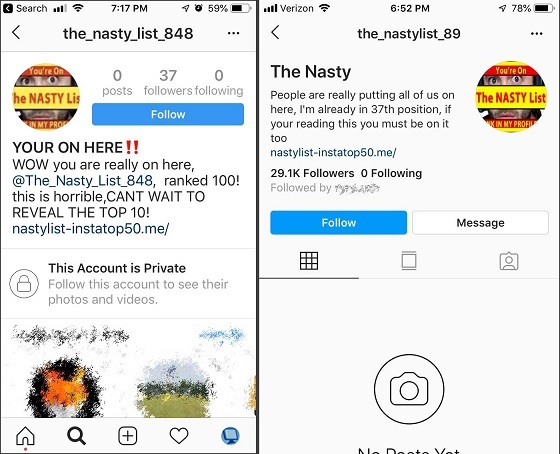 The Nasty List scam is being spread through hacked accounts that send messages to their followers stating that they were spotted on a so-called "Nasty List". 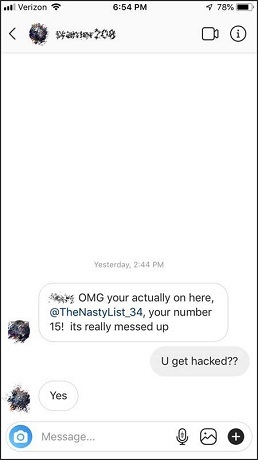 These messages state something like "OMG you're actually on here, @TheNastyList_34, your number is 15! it's really messed up." 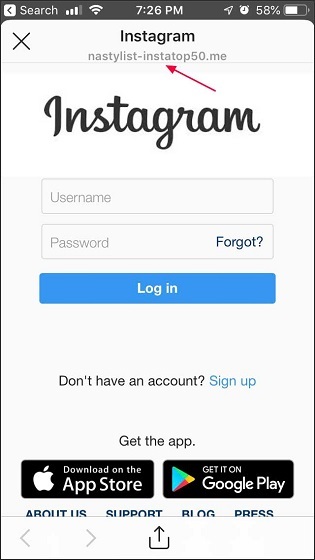 If a recipient visits the listed profile, it will be named something like "The Nasty", "Nasty List", or "YOUR ON HERE!!". The profiles include a description similar to "People are really putting all of us on here, I'm already in 37th position if your reading this you must be on it too." or "WOW you are really on here, ranked 100! this is horrible, CAN'T WAIT TO REVEAL THE TOP 10!" as shown below.